Households are by no means the only actors whose investment decisions are worth examining — for example, markets are closely watching whether and how much Japanese pension funds will shift from bond holdings to equities or other assets — but the decisions made by households and the attitudes expressed by Japanese citizens in opinion polls are revealing when it comes to understanding how Japanese think about Japanese capitalism, the role of investing and shareholding, and the degree to which they have embraced (and will embrace) reforms to encourage more risk taking and competition in the Japanese economy. By and large, Japanese households have been reluctant to embrace shareholder capitalism. Equities made up nearly a fifth of household assets at the peak of the asset bubble, but since then household shareholding has fallen dramatically, notwithstanding Japan's "Big Bang" financial reforms and other government efforts to encourage investment. Despite low interest rates on bank deposits, low yields on government bonds, and, as I have documented previously, persistent fears about the reliability of the public pension system, Japanese households have been extremely reluctant to move into higher-yielding assets. It is important to keep this reality in mind as one assesses the Abe government's likelihood of success in triggering sustainable growth; Abenomics has to change ingrained attitudes about saving and investment that have heretofore proved resistant to policy change and macroeconomic change. Pollsters began taking more of an interest in Japanese attitudes regarding the financial sector in the late 1990s as the Hashimoto government implemented the "Big Bang" reforms, which deregulated foreign exchange and securities markets, the insurance industry, and the banking sector. The reforms were, among other things, supposed to make it easier for households to diversify their investments. However, a poll conducted by Asahi in March 1998 found respondents unsure of financial reform. Asked whether they were hopeful about the Japanese-style "Big Bang," only 32% said they were hopeful, while 43% said they felt great anxiety and other 21% said they didn't know. When asked whether they would try to purchase higher-risk, higher-return financial instruments if it became possible to do so, only 16% said they would — 80% said they would not. 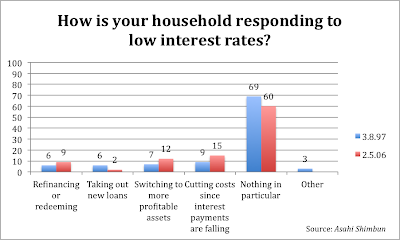 The same poll found that the public mostly wanted banks to pay higher interest rates on deposits: the poll found 26% of respondents were fine with low interest rates as they were, while 66% wanted interest rates raised. 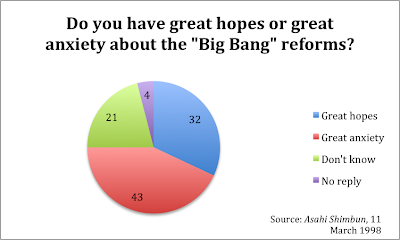 Another Asahi poll in May 1998 found respondents more favorably disposed to the "Big Bang," but not by much. Asked whether they welcomed having the responsibility to choose from a variety of financial products and being forced to decide which are profitable and which are safe, 41% said they welcomed the responsibility, 38% did not, and 14% said they did not know yet. Respondents were slightly more open to purchasing assets that would yield more than bank deposits but would also be more riskier: 21% said they would like to purchase them, 72% said they would not. Respondents appeared somewhat more open to having greater control over retirement funds through the introduction of a Japanese-style 401(k) system. A July 1999 Asahi poll asked whether respondents would accept the greater responsibility that would come with the introduction of a defined contribution pension program: respondents favored the notion 44% to 43%. Respondents also proved more favorably disposed to participating in a 401(k)-style program than to other forms of investment. 29% said they would like to participate, with 58% opposed. The problem, however, is that over the following decade Japanese households have not become any more favorably disposed to investing than they were when financial reforms were first introduced. Asahi polls — one from March 1997 and the other from February 2006 — illustrate the inertia of Japanese households. 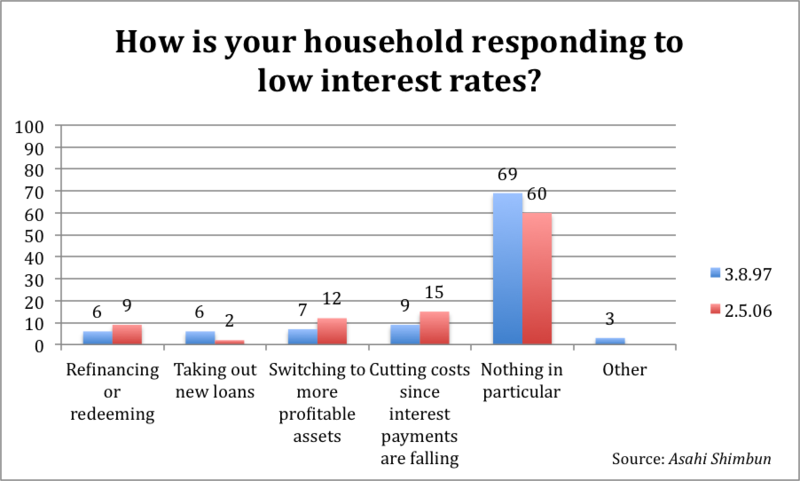 When asked how their households were responding to low interest rates, in both polls at least 60% of respondents said "nothing in particular." In 1997, only 7% said they were moving deposits to more profitable investments like stocks and other financial instruments. In 2006, that figure rose only to 12%. The February 2006 poll found scant interest in investing more in equities, let alone more complex instruments. When asked whether they wanted to invest in stocks, 11% said they already did, another 15% said they would like to, and an overwhelming 65% said they would not like to purchase stocks. On the one hand, 65% is better than the March and May 1998 polls that found 80% and 72% of respondents uninterested in purchasing higher-yielding assets. On the other hand, when one considers that nearly two-thirds of respondents in February 2006 — in the midst of low interest rates, concerns about the security of public pensions, and a stock market that would make five-year highs in 2006 — expressed no interest whatsoever in stock ownership, one gets a good picture of inertia in Japanese household assets. The poll did ask respondents to explain their answers to that question. Among the 26% who said they either already invested or wanted to invest in stocks, 11% cited higher returns, 8% said they bought stocks because it had become easier to do so, 4% said because they thought it was interesting, and 1% said they did it in order to prepare for bank failures. Among the 65% who expressed no interest, 25% said they did not have enough money available, 17% said they feared losses, 12% said they felt it was difficult, and 5% said it was because stock investing "does not have a good image." The cautiousness of Japanese households was reinforced in the next question, which found that, if respondents were to invest, they would prefer financial instruments with relatively lower returns but with low risk of loss to higher risk, higher return instruments by a margin of 54% to 5%. Finally, the poll asked an interesting question to gauge general attitudes about stocks and investing. 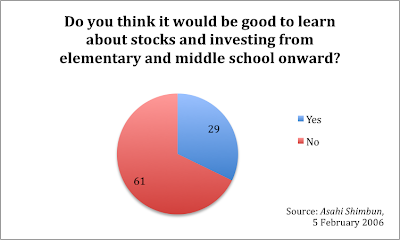 Asked whether they thought it would be good to learn about stocks and investing from elementary and middle school onward, 29% said yes, 61% said no. Another question asked whether respondents felt opposition to making large profits by speculatively investing great sums of money in the stock market and elsewhere: 48% said they were opposed, 40% said they were not. Arguably these responses are clear indicators of the degree to which investing was still considered abnormal, perhaps even unseemly. Not only did a sizable majority of respondents not want to own stock, they did not want their children learning about the stock market and they felt there to be something illegitimate about fortunes made through speculative investments. And this poll was conducted several years before Japan would be dragged back into recession by the global financial crisis, which, as then-Prime Minister Asō Tarō repeatedly reminded his fellow Japanese, "originated from America" (i.e., home of Wall Street's casino capitalism). A Cabinet Office poll conducted (jp) in December 2005 confirms this aversion to financial investing. 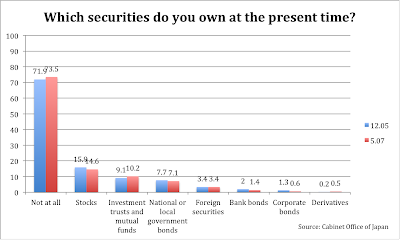 71.9% of respondents said they owned no securities whatsoever. Among those who owned securities, the most commonly held security was stocks (15.9%), followed by investment trusts and mutual funds (9.1%), national or local government bonds (7.7%), foreign securities (3.4%), bank and financial bonds (2.0%), industrial bonds (1.3%), and derivatives (.2%). The survey also asked whether respondents owned, wanted to own, did not want to own stocks, or own stocks but want to stop. These figures are similar to the February 2006 Asahi poll: 13.3% owned stocks and wanted to continue, 8.6% wanted to start investing, 2.7% wanted to quit, and 68.5% had no interest at all. Respondents' reasons were similar too. Among investors or would-be investors, 48.3% said they invested because they hoped for higher returns, 45.6% said they hoped for dividends, and 31.2% said they wanted to invest their money beyond bank deposits. Among non-investors, 39% said they lacked the knowledge, 36.9% said they feared the risk of losses from falling prices, and 34.5% said they lacked the assets and income with which to invest. 52.3% said it was because they felt secure entrusting their money to banks and post offices. 43.3% said it was because of the possibility of losing one's investment despite the possibility of profit. 40.2% said it was because they did not know enough about stocks and other investments. 32.2% said they did not know which stocks are good to purchase. 28.4% said it was because they felt a great lack of confidence in securities firms and securities markets. 41.4% said to prepare a system to protect individual investors, strengthen explanations of the contents of financial products and their risks. 38.1% said strengthen market supervision. 26.9% said to reduce the tax burden for holding and trading stocks. 25.5% said to simplify tax payment procedures. 17.4% said to make it possible to buy stocks and other financial vehicles in various places. 11.5% said to promote financial education. 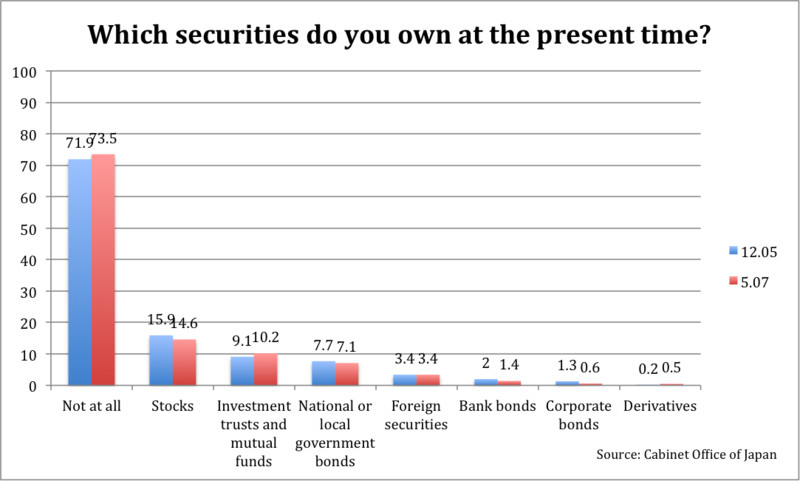 By May 2007, a marginally greater number of respondents said they owned no securities whatsoever and ownership rates fell in every category except investment trusts and mutual funds and foreign securities, which were held by the same share of respondents. Respondents were, if anything, even less inclined to invest than before. 77.1% of respondents said they either did not plan to invest in stocks (74.1%) or owned stocks but planned to quit (3%). Only 18.6% said they owned stocks and wanted to continue (11.3%) or didn't own but wanted to (7.3%). Not surprisingly, respondents were even less favorably disposed to investment trusts: 78.8% said they either had no plans to invest (76.9%) or wanted to stop (1.9%), while only 14.9% said they owned trusts (8%) or wanted to (6.9%). Interestingly, when the respondents who said they wanted to or wanted to continue to own stocks were asked why, the reasoning changed a bit from the December 2005 poll. Now 46.9% said they wanted to because of the promise of dividend payments, followed by 39.8% who said they wanted to hold stock because of the promise of gains from rising prices and 33.9% who said they wanted to diversify beyond bank deposits. Fewer said they wanted to prepare for retirement (20.2%) or to invest retirement money more effectively (10.9%). Only 3.1% said they did so because they belonged to a defined-contribution pension plan (which had been passed into law by the Koizumi government in 2001). In short, on the eve of the global financial crisis, only approximately one in ten Japanese households owned stocks, and nearly eight out of ten households had no plans to purchase stocks. Knowledge about and desire to own other financial instruments was considerably lower. Unfortunately, I have thus far been unable to find opinion polls regarding attitudes towards investing conducted after the global financial crisis. 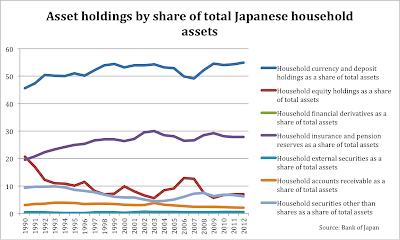 However, as the BOJ data cited above shows, since 2008 stocks as a share of total household assets have remained consistently below 10% after a brief spike during the latter part of the Koizumi era. Considering the reasons given by Japanese for not wanting to invest, it is hard to believe that their attitudes towards financial markets have changed dramatically. It is similarly hard to believe that recent volatility in the markets will lead more Japanese households to invest. It is therefore important to remember, in the midst of enthusiasm about Abenomics, that the Japanese public has repeatedly showed itself to be risk averse in its investments and deeply reluctant to shift from virtually risk-free bank deposits to other financial assets. Despite — or because of — their fears about the pension system, Japanese households have not sought higher yields. As a result, Japanese households by and large have not directly benefited from stock market gains under the second Abe government (and, as I've discussed before, they have probably not been the direct beneficiaries of the weak yen). This is not to declare Abenomics a failure, but rather to provide a fuller accounting of the obstacles the Abe government must overcome to succeed in its bid to trigger sustainable growth. Maybe this time will be different than in the past, but for now Japanese households do not seem poised to become more active (or activist) investors. Sounds like the Japanese are very sensible not wanting to gamble with their futures. That kind of risk is best left to professional gamblers and people wealthy enough to be able to afford the losses. Americans were basically sold a bill of goods by a clever financial sector. Exactly right. I think there's an undercurrent throughout these polls that the Japanese people know how much they don't know and how vulnerable that makes them. Interesting comment and I agree. However, a bit of history is in order. I was a stockbroker in Tokyo from 1977 to 1990 so I was present for the entire Bubble Economy. During the Bubble, stock market investing was very popular among all kinds of people. Under the right circumstances, Japanese can be just as enthusiastic about equity investing as anyone in the West. Prior to April 1, 1991, capital gains were not taxed. It was very easy for an individual investor to make a lot of money in the stock market and pay no taxes on that income. This involved a certain amount of tax evasion but the practice was well-known and widespread. Shopkeepers in my neighborhood were aware of my profession and I could not buy fish or vegetables without discussing one stock idea or another. I knew quite a number of ordinary people who made a nice income on the side from trading stocks. In the days before the Internet, there used to be stockbrokers' offices in every neighborhood where people would gather to watch the market, trade shares, swap stock tips, drink tea and smoke cigarettes. It really was a very social experience. The Japanese equity market has not been a friendly place for investors since the end of 1989. An entire generation has grown up with no knowledge of a bull market and no concept that the stock market is a place where you can make money. It's going to take a long time for this attitude to change. We are beginning to see the first signs of individual investors getting back into the market. It's going to take a while but there was a time, a long time ago, when everyone played the market. Thank you for that comment! Really valuable perspective. You raise an important point, which I was careful to avoid: the aversion to the stock market is not cultural, but rather the product of experience. As you say, astutely, "An entire generation has grown up with no knowledge of a bull market and no concept that the stock market is a place where you can make money." It's going to take more than a quarter's worth of gains for attitudes to change. An excellent article Tobias, and interesting comments. The BoJ Q1 2013 flow of funds data was released on June 24th, and if you do a see-through analysis (looking into the components of households' life assurance and pension fund investments) you can get an excellent picture of the current Japanese Household assets which total more than $15 trillion. Cash deposits in Japanese banks are 55.8% of assets and Japanese bonds (mainly held indirectly through life policies) 20.5%. Equities are 10.9% and off-shore securities 7.1%. The proportion of assets that would provide protection in a weak Yen/higher inflation environment is 18%. We must adjust this down however for the Yen hedging against offshore securities done by the insurance companies and pension funds, to an estimated 14.3%. This has grown from 12.6% at Q4 2012. This positioning has historically made good sense, as despite low (or zero!) nominal interest rates,declining prices meant households could achieve a good real return with out taking any perceived risk. However, if the environment changes and prices rise, the risks migrate to inflation eroding your purchasing power, and "safe" assets become risky. So in effect more than 85% of household assets would be vulnerable to declines in real value if the BoJ's inflation target is achieved. Ironically given the low nominal interest rates, Japanese households can obtain protection from this scenario AND improve their yield (the Topix yields >2% and dividends are forecast to grow >30% in 2013, or offshore securities based on bonds also provide a massive yield pick up). This seems like a win-win to me, and while who knows whether inflation will be in Japan's future, betting with >85% of your assets that it won't is actually a very risky position. I have heard many criticisms of the attempts to inflate, but few politically viable alternatives given the huge government debt burden. One last point, Japan has amongst the best life expectancies in the planet, with the average person living almost 20 years from retirement. The idea that retired people reduce risk by holding cash and fixed income securities does not apply in an inflationary environment, the rules change. Those rules are long forgotten in Japan. This positioning has historically made good sense, as despite low (or zero!) nominal interest rates,declining prices meant households could achieve a good real return with out taking any perceived risk. However, if the environment changes and prices rise, the risks migrate to inflation eroding your purchasing power, and "safe" assets become risky. If prices rise. But inflation has been entrenched for many years now, and there's structural reasons for it to stick. It seems rather premature to bet on it suddenly reversing. Until it does, completely risk-free bank savings is actually a very good idea. I would add that Japan's entire post-Bubble experience is unique in financial history. No major stock market has remained at only 25% of its peak level after 20 years. The inability of the Japanese stock markets to recover is an important cause and effect of the public's refusal to buy stocks. 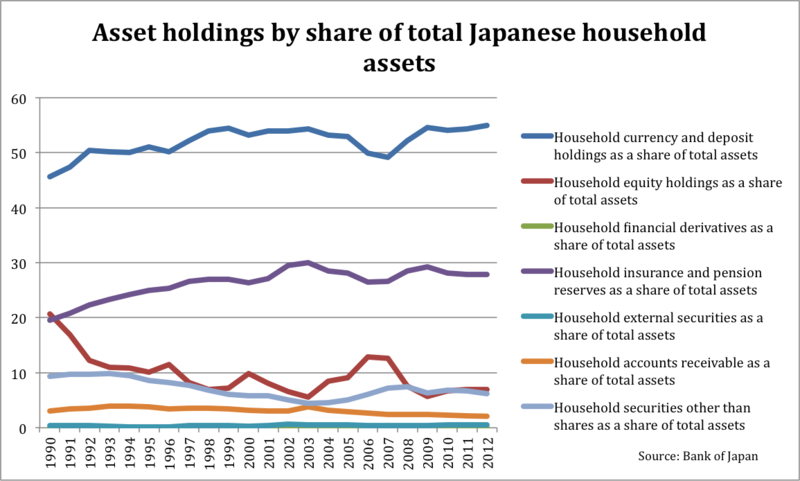 But Japanese households still look for higher yielding assets, as the 'Mrs. Watanabes's' on-off yield carry trades demonstrate. This implies that a powerful self-reinforcing mechanism could kick in and take stock markets far higher if Abenomics is accepted, but that the entire process could also easily reverse given the deep mistrust of equities embdedded in the Japanese populace.